Though it is considered by the forthcoming official biographer of Joseph P. Kennedy, David Nasaw, to be a "thoroughly revisionist" history, Will Swift's "The Kennedys Amidst the Gathering Storm: A Thousand Days in London, 1938-1940" is actually more derivative than revisionist, from its title (borrowed from Winston Churchill) and its subtitle (borrowed from Arthur Schlesinger Jr.) through its 374 pages of mostly borrowed quotations and previously published information. But if the book treads a well-beaten path, with no revelations or fresh interpretations, it nevertheless succeeds where so many biographies of Joseph Kennedy have failed: It is delightfully readable. Swift, as a licensed clinical psychologist, seems an unlikely author for a historical work, but he has already written an account of the Roosevelt family and the British royal family, and so is no stranger to social niceties, on both sides of the Atlantic. In this new work he has chosen well, moreover, by focusing on just two years of the oft-chronicled Kennedy family saga. In 1938 Boston financier and entrepreneur Joseph P. Kennedy, who had tried his hand successfully at a host of occupations, from shipbuilding to movie production, and had served the FDR administration as first chairman of the Securities and Exchange Commission, then chairman of the Maritime Commission, demanded a reward for his loyalty: an ambassadorship to Great Britain, whose empire still encompassed half the world. Other men before and after Kennedy would serve in the post, but Kennedy's appointment made history, and for a variety of reasons. First, there was the very Irishness of the Kennedys of Boston and their Catholic faith. Then there was Kennedy's well-known affair with actress Gloria Swanson. Also there was his reputation as a maverick entrepreneur rather than a trustworthy spokesman for President Roosevelt. Finally there was the fact that Kennedy had the opposite virtues of a great diplomat. He was, in short, a straight shooter who did not mince words. The resulting story is an intensely human saga, in which we follow an as-yet-unroyal American family across the Atlantic to the epicenter of Britain's fabled high society. 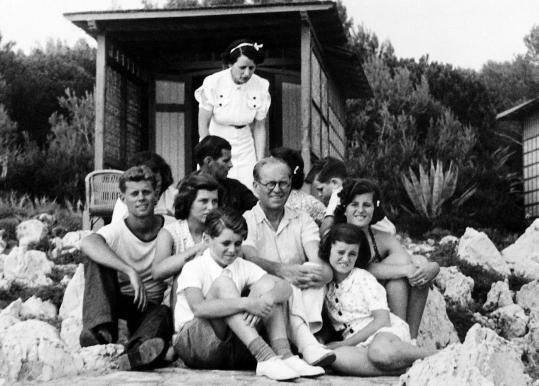 The Kennedy cast (for this could well turn into a Broadway show and film) encompasses: Joe Kennedy, financier, movie mogul, and businessman; his wife, Rose, princess-daughter of the former mayor of Boston, John "Honey Fitz" Fitzgerald; and their nine children. Kennedy, it transpires, has a brilliant eye for publicity, so sees what no previous US ambassador in England has quite cottoned on to: namely that, far from keeping a low profile, he can not only shake up the traditional, all-male, sober world of world diplomacy but give his family a tremendous social lift while using his brash American businessman's acumen and forthrightness to ensure that the United States makes no dumb investment in another nation's woes. Thus begins the Dance of the Kennedys - literally and metaphorically. Rose stops other American debutantes from coming out in London, while pushing forward her own daughters: plump Rosemary, who is mildly retarded; diminutive Kathleen, or "Kick," who becomes the most beloved American girl in town; and gangly Eunice, who has no beaux and prefers tennis. Meanwhile Joe prods and pushes his two eldest sons, Joe Jr. and Jack, arranging internships and introductions for them across Europe and providing them with diplomatic passports, in return for which they help write his speeches and send back personal impressions from Spain, Germany, Russia, Poland, the Baltic States, and Palestine. Would that this story of an ambitious, handsome, wealthy, talented American family in the run-up to World War II had a happy ending. But as Swift relates with welcome evenhandedness, it doesn't. The saga is studded with contradictions that hold our unflagging attention. Rose spends much of her time visiting her dressmaker - but she also recognizes more clearly than anyone in the family that her husband, by attempting to make isolationist American policy rather than allow the president to do so, is wasting his time. Joe, befriending Prime Minister Neville Chamberlain and urging appeasement in Europe, cannot and will not see this. For him, doom will be another world war, like the first one, which he avoided while his Harvard friends volunteered, and in which some died. Of course, Kennedy is right: World War II will take its bloody toll, including the death of his eldest son, and the ruin of his second-born's health. But unlike his wife, he cannot see that the democracies have no option: that in the face of escalating Axis aggression, the Allies must stand and, if necessary, fight for what they believe in - or be felled. Veering from press conferences to petticoats, magnificent balls to midnight meetings, this is history light but saga strong. In an age of memoir, the decision to write an account of the Kennedys via a small window during a short, fashion-fueled period of their family history is very wise. Despite Swift's clinical license there is thankfully no psychological profiling here. As a historian and professional biographer I'd recommend that the epilogue, recounting the after-stories of the Kennedys, be removed in the next edition, since Swift's potted post-London lives are whitewashed beyond credibility, and unnecessary. We know, after all, the longer tale, which has been told by many hands; what we have, meanwhile, in an age of faux memoir, is a true memoir: a group portrait that comes to brief and haunting life, in a story remarkably well told. Nigel Hamilton is the author of "JFK: Reckless Youth," as well as multivolume lives of World War II general Bernard Montgomery and President Bill Clinton. His latest work is "How to Do Biography: A Primer."